Do you ever feel out of step with time? My grandmother said I was born a generation too late because I enjoyed visiting her on the farm so much. But it took me thirty-five years to get in the spirit of the hippie back to land movement. I enjoy books about women who live in remote locations. I found such a book in a BC Ferries gift shop. 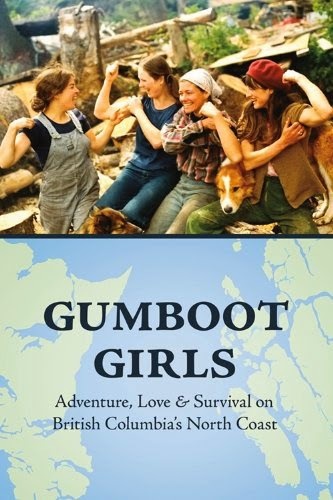 Gumboot Girls: Adventure, Love and Survival on British Columbia’s North Coast is a collection of thirty-four short memoirs that was compiled by Jane Wilde and edited by Lou Allison (Caitlan Press, 2014). Jane was among many adventurous women who came to Coastal BC in the 60s and 70s. This book highlights the lives of fifteen women who landed on the remote islands of Haida Gwaii (known then as the Queen Charlottes). Nineteen of the women made their homes in or near Prince Rupert on the mainland. 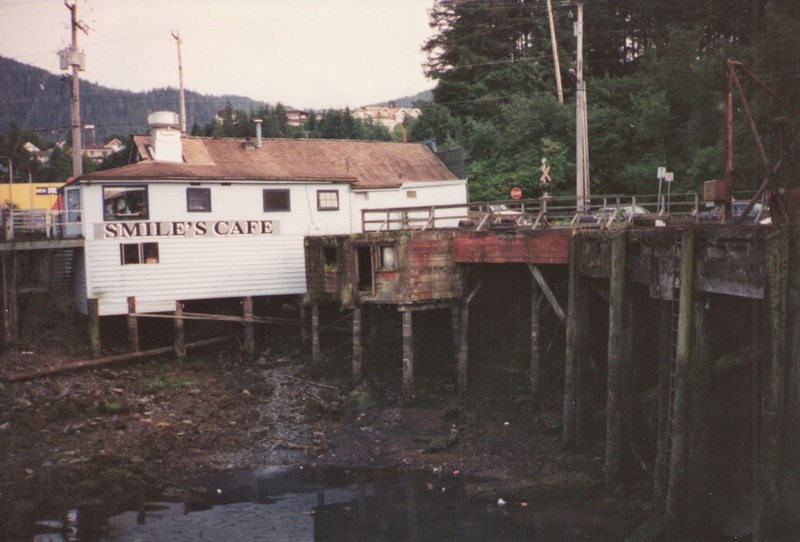 Prince Rupert waterfront cafe in 1994. From all across Canada, the United States, and even France they came. Many were drawn north because of the desire to live a self-sufficient lifestyle away from the pressures of society. Some of the women followed men avoiding the draft and Vietnam War, some followed family and friends who had gone before them, and some came just for the experience of a lifetime. Most lived in abandoned cabins or built their own during a time when restrictions were minimal or not enforced. Gardens were planted, chickens and goats raised, food canned for winter. For money, some fished with their men, worked seasonally in canneries, or took traditional nursing or teaching jobs. But getting to work was anything but traditional. Life on the north coast required boating skills and crossing dangerous waters in all kinds of weather. 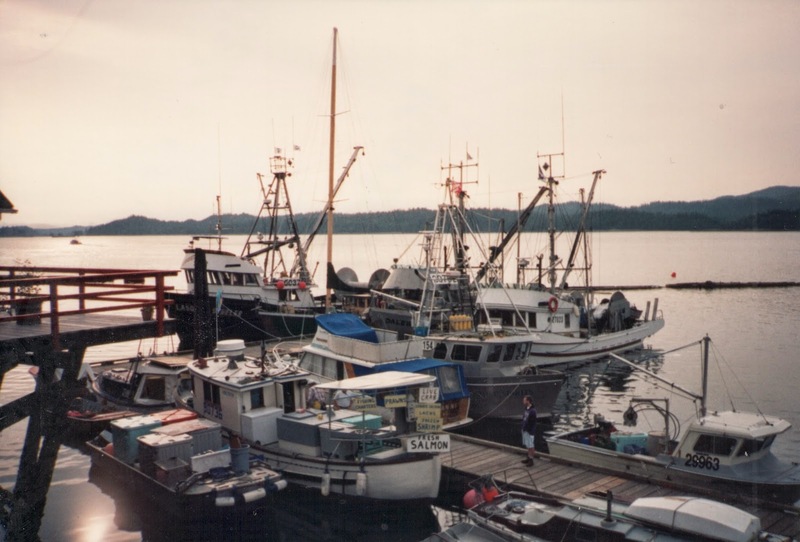 Prince Rupert fishing boats in 1994. Living near like-minded people resulted in communal activities and support. It was a time of free love, living simply off the land, and few responsibilities (except for their own survival). Fresh seafood that we consider expensive delicacies was free for the taking. Some of the women stayed, but most moved on to finish their education or return to larger cities. Even so, their north coast experience shaped their futures and those adventurous years were never forgotten. I think your grandmother was onto something. You have such an adventurous soul. I love the thought of wilderness living, but I think I need something in between big city life and the wilderness. Thank you for reviewing! What a cool true story! I can see why you enjoyed it. Being one of the "Gumboot Boys" put me in a very advantages position, what with all the adventurous women about. Clearly a high point in my life right when I needed it. Who was it that said "you always get what you need"? To me it sounded like a very exciting experience. I am living off the grid now as an older adult. At least I got a chance before it was too late. Will there be a sequel, Gumboot Boys?